Jon Snow might be one of the last men standing when Game of Thrones Season 8 comes to a close. The highly anticipated final season of the hit HBO show is almost upon us and fans are starting to get more than a little impatient. It's been over a year since we last saw anything from the show and there are many mysteries still left to be solved in the last six episodes and one of them may have just been solved by Jon Snow actor Kit Harington. In a recent interview, Kit Harington talked about just how hard it was on the cast and crew to make Game of Thrones Season 8. The budget was much bigger for the final season and as Harington says, HBO went for it, though he used another term. Over the course of 8 seasons, the Jon Snow actor reveals that everything from the weather to the costumes took their toll on everybody, which is when things start to get interesting. Harington had this to say. "I was there the whole time this year. I felt a bit like people were coming in and out, and Jon Snow was just f*cking there the whole time. You have these in-jokes, and these relationships that thrive for eight years. That's a long time for those jokes to be going, and they never felt old or tired. In the last season, I was like, these are getting tired now. And I think they got tired because we could see the end coming. That's a way of emotionally detaching from something: relationships very slightly starting to strain, just on the edges, just frayed. Now everyone loves each other again." 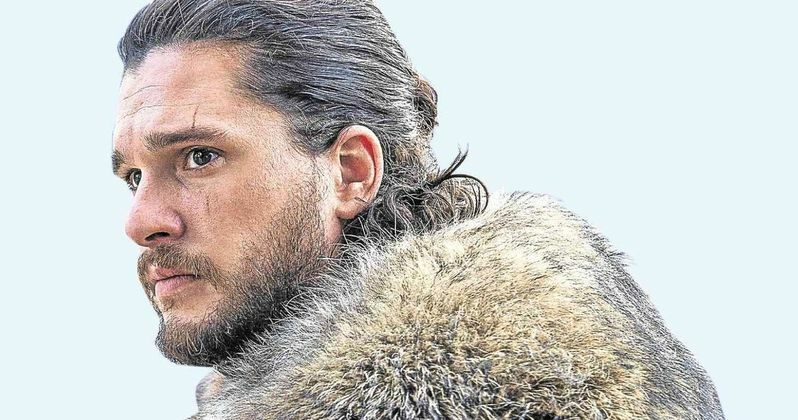 Since Kit Harington was on set the entire time and watched people come and go, it is easy to assume that Jon Snow could be one of the final survivors at the conclusion of Game of Thrones Season 8. This is huge news if true, but it obviously has not been confirmed by anyone at this time. Harington might have just been excited and wanted to be there for everything, but his comments on the harsh weather make it seem like he was more than likely working, as opposed to just hanging around. While Kit Harington could not talk about Jon Snow's Game of Thrones Season 8 fate, he did indicate that he was "satisfied with how his story ended." Harington also revealed that Peter Dinklage wrapped production on the day before he did, noting that he watched the actor "just break down," after filming his final shots for the iconic TV series. Arya Stark actress Maisie Williams says that she was also one of the final actors on the set and that she watched a lot of people wrap. Will the Starks get the happy ending when Game of Thrones comes to a close? That is a real mystery at this time, but it seems unlike the series to give such a positive ending. With that being said, there is going to be a lot of bloodshed along the way, no matter what, so it's going to be very interesting to see who makes it all the way to the end. The interview with Kit Harington was originally conducted by Variety.